The market for 3D printed body parts is growing. And following the recent success of a titanium and polymer implant, Australia is well placed to lead the way. A New York cancer patient recently received a 3D-printed titanium and polymer sternum and rib cage in a first for the United States. The patient, Penelope Heller, 20, was diagnosed with chondrosarcoma (a rare bone cancer) in 2014 and had to have her cancer-affected sternum removed. While an off-the-shelf implant had been provided for the patient and her cancer was removed, she experienced ongoing pain and problems breathing after the operation. Heller underwent further surgery to replace her existing solution with a customised 3D-printed sternum and partial ribcage developed by CSIRO and Australian medical device company Anatomics. The process took around four to five weeks end-to-end, with the actual build time of the implant taking about 12 hours. A polymer called PoreStar by Anatomics, a lightweight porous polyethylene material that replicates cartilage and soft tissue to facilitate tissue integration, was also used. There were numerous challenges during this process, from ensuring it proceeded exactly as planned to checking to see that the part had been built as it was designed, which can be done by doing a 3D scan and checking that the part matches the original file. “It’s mostly about the process itself, that it’s run as we expected it to run, that there are no reported deviations in how the machine’s operated and the part is basically built to spec,” said Dr Leon Prentice, research director at CSIRO. Heller’s operation is just one of many that are now being performed using 3D-printed body parts and tissue – most recently, a 3D-printed skull helped to save an Australian newborn who couldn’t breathe. While the technical challenges seem to be reducing day-by-day, Prentice said future challenges will involve how to manage and streamline the process. “At the moment, because it’s so specialised, it’s very labour intensive for the people doing the design work or the people doing the finishing. But as these technologies get more widely used, that process can be streamlined,” he said. Prentice cited the example of 3D-printed sternums, with only a few cases of these being used around the world, including world-first surgery to implant a 3D-printed titanium and polymer sternum into a British patient. With a vast amount of data collected and used during the process, Prentice said being able to manage the information flow through the system, from the surgeon and patient’s data to the design, printing and delivery, will be a challenge. “It’s the challenge of the future because at the moment we’ve put a lot of effort into managing things case by case. The way to streamline this is to make that information flow a lot simpler and faster,” he said. 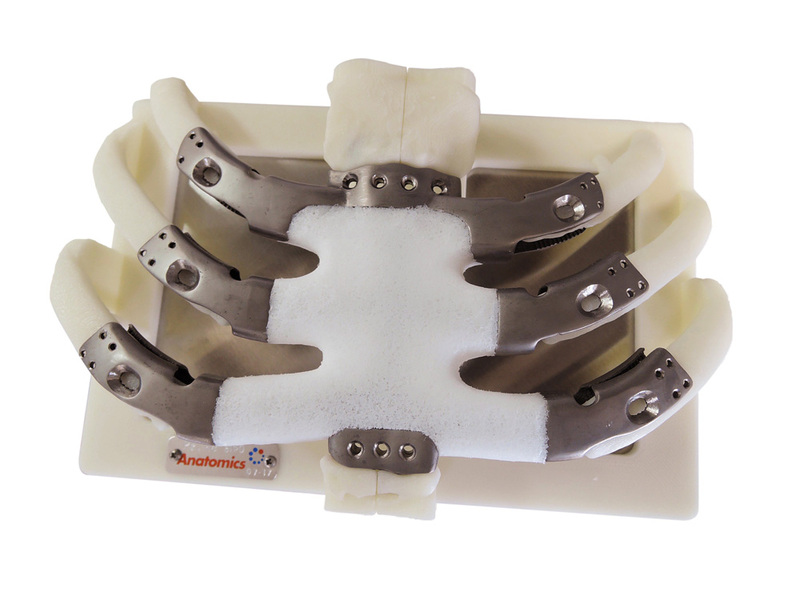 The 3D printed sternum and ribs implant, as shipped on its mount. Prentice said that order could then be sent and someone would carry out final design tweaking, and it would then be shipped off for manufacturing. The key to a system like this is having the entire process viewable online, with Prentice saying the start of a system like this could be around one or two years away, and a fully streamlined rapid development probably about five years away. Prentice said Australia is making gains in the world of 3D-printed body parts, and the country has a niche role to play. For example, he said Australia has remarkable skills in patient-specific design in terms of the end-to-end flow of information because the size of our industry means people know each other and can streamline and accelerate the process. But the industry’s size can also mean a lack of critical mass, which can make it difficult for companies to gain an economy of scale that makes it worthwhile, CSIRO’s Dr Leon Prentice said. “At the moment we, in CSIRO, host the only two electron beam additive machines in Australia, and for someone else to get into the market, which we’d really like them to do, would require a significant investment,” he said. But as more examples of 3D printing body parts gain exposure, Prentice is hopeful that it will start to pick up speed and more creative solutions are implemented.